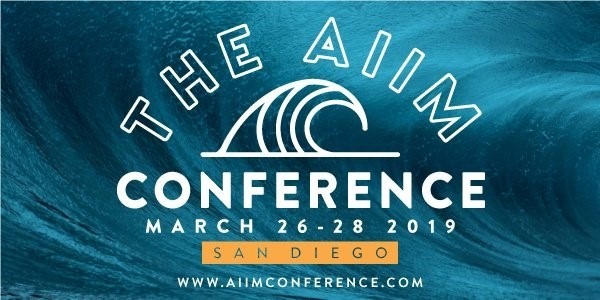 AIIM Conference 2019 – Fasoo U.S.
Fasoo is excited to be a gold sponsor this year at the AIIM Conference in San Diego. We have worked closely with AIIM this year, releasing a research study with them about Automating Governance and Compliance. The conference theme is “Your Digital Transformation Begins with Intelligent Information Management.” AIIM’s approach to Intelligent Information Management is the following: How effectively you navigate your Digital Transformation journey relies on how adept your organization is at combating the rising tide of information chaos. This requires new information management strategies and skills that extend beyond traditional ECM. This fits nicely with Fasoo’s innovative solutions, especially our platforms Wrapsody and Wrapsody eCo. Stop by Booth #41 at the Conference to learn more!